For a few years I ran my own little design company called "The Dutch Touch". While I enjoyed working for and with every client, now that a move to a different state is in the near future, I have closed the doors of my company. Thank you for your patronage. For gardening clubs in Pennsylvania who would like me to do a presentation for their club, please check below and check the "presentation" tab. Years ago my garden was officially designated as a Backyard Wildlife Habitat by the National Wildlife Federation. In 2017 , after working on my new garden In Pennsylvania, I also had this garden certified as a Backyard Wildlife Habitat. What exactly does that mean? Well, my garden, and that extends to the front yard as well as the backyard, is a place that attracts wildlife by providing food, water and cover. It is a place for wildlife to raise their young; in my case, yes it includes bunnies, but also a wide variety of bird as well as insects. I have attracted a bat as well and while bats may seem like a spooky addition to the garden, they eat lots of mosquitoes and, frankly, I like them; a lot. Butterflies call my garden home, but you wouldn’t have butterflies without caterpillars so I add specific plants to the garden to serve as host plants, i.e. food for caterpillars. The black swallowtail butterfly lays its eggs on parsley and each year a twelve pack of parsley plants are spread around the garden just for that reason. Lots of flowers in the garden attract bees, butterflies and hummingbirds. In my garden you will also find a moth called hummingbird moth, which (duh!) resembles a hummingbird, but it is a member of the Sphinx moth family. Two ponds provide access to fresh water for all kinds of critters and birds, and they are also home to several frogs. Each year dragonflies lay eggs at the water’s edge and the resulting nymphs continue their life cycle in the pond. Once the nymph is fully grown it will crawl up out of the p0nd, shed its skin and fly off as a dragonfly, thus completing the cycle. In order to be certified as a Backyard Wildlife Habitat, you need to fulfill various criteria (see the requirements by following the National Wildlife Federation link listed above). One of those is the absence of use of pesticides or herbicides. After all, when you use pesticides in your garden, you are liable not only to kill off the offending bug but also the predator of that bug, as well as many other beneficial insects. While my garden has been pesticide and herbicide free pretty much since the beginning, I recently attended a course at Rutgers on IPM, or Integrated Pest Management to learn a lot more on the subject. While IPM does allow for the use of pesticide when needed, it also teaches to recognize pests, their life cycle, and ways to garden to decrease the pest population. I have no pesticide license (as required in NJ for a professional using any type of pesticide or herbicide) and I do not plan on getting a pesticide license as I am committed to organic gardening as a professional. But a complex garden, i.e. a garden which has a variety of plant species (evergreens as well as deciduous trees, shrubs and perennials) will attract a variety of wildlife, including birds and bugs and beetles. This makes the garden more stable, requiring less, if any, pesticides. Does that mean you will never see an aphid or any other bug on your plants? No, you will still get aphids, or spider mites, or any other type of bug on your plant. But the nice thing is, soon after the pests arrive, the predators follow. Aphids will be followed by the lady beetle, and soon enough the larvae of the lady beetle as well will put a serious dent in the aphid population. Certain birds will feed on insects, and even tiny little spider mites will be consumed by equally small spider mite predators. If you are interested in creating a more complex garden, eliminate the use of pesticides or providing a wildlife habitat, check out the National Wildlife Federation website, this website, or contact me directly. 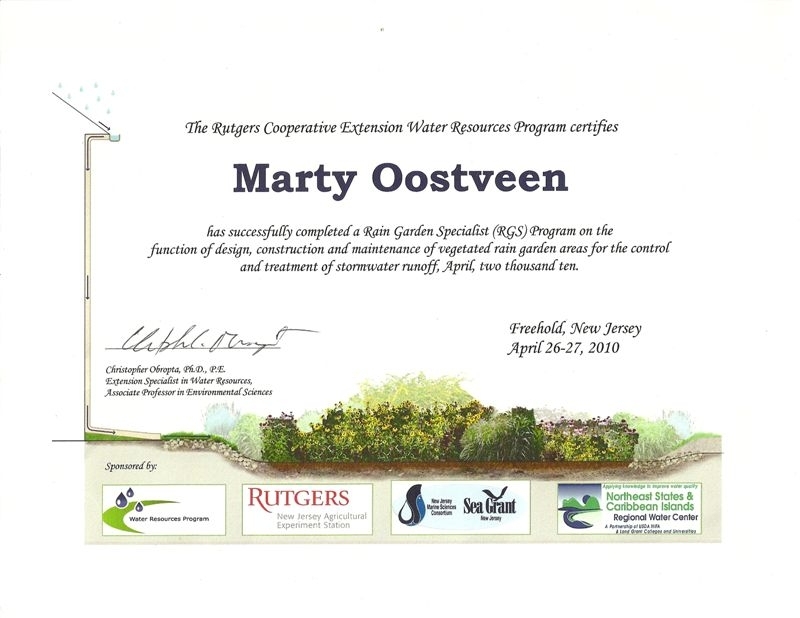 I successfully completed a course in the design and installation of Rain Gardens at Rutgers University in May 2010. In our new garden in PA I put all of this knowledge to good use in order to reduce run-off from our property and installed an appealing slice of nature which will look good in both wet and dry conditions. I am available to do presentations to gardening clubs within approx. 50 miles of Douglassville, PA. on a number of subjects. Presentations will include a digital slide show. I am available during most days or evening. Please call to discuss possible subjects for presentations or for bookings. For more information on the various topics, please check out the tab "Presentations". I have been the president of the Gardeners of Somerset Valley gardening club from April 2010 through 2015 as well as co-program director. This group of gardeners meet monthly in Bridgewater, New Jersey. You can find more information about the club at www.wegarden.org. Join them if you can for a meeting; they welcome all prospective new members and they are a really great group of people with lots of gardening knowledge to help others in their quest for their gardens. Gardeners Supply Company did a short story about me and my garden a while back. You can find it by following this link: http://www.gardeners.com/Marty-Oostveen-Garden-Transformation/5691,default,pg.html. Recently an article appeared in the e-magzine Dig-it. I met with the editor of the magazine in late summer 2013 and let her roam the garden. The following article is the result of this visit, which focused on the transformation of empty plot into a Certified Backyard Wildlife Habitat.